Notes: Brynkir was situated on the Menai Bridge – Afon Wen line which opened in stages between 1852 and 1871. It was on the western edge of the village from which it took its name. 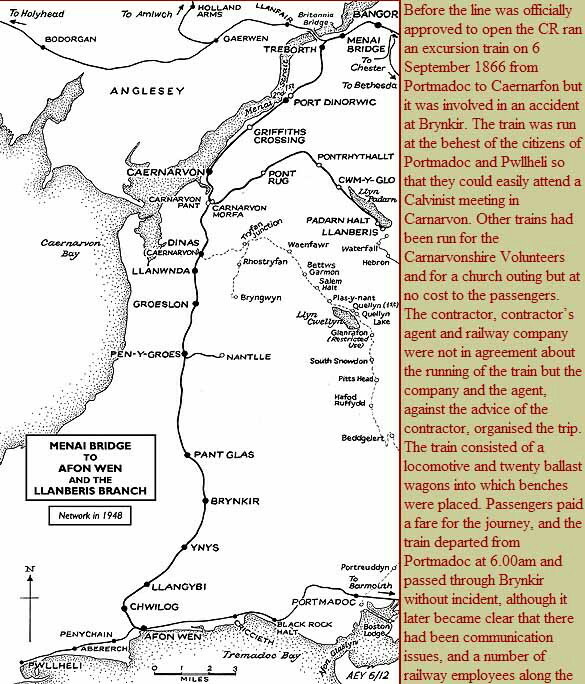 On 29 July 1862 the Carnarvonshire Railway (CR) was authorised to build a line between Caernarfon and Afon Wen and by October 1866 it was mostly complete and was inspected, but its opening was not approved until 2 September 1867 by which time all work was finished. line were not aware of the train. The return working departed from Carnarvon Pant at 7.00pm. It was a dark and stormy night, and the train stopped short of Brynkir station to take on water. After it did so it set off again. The line had been set so that the train would take the west line (what became the up) of the loop past the station as there was a wagon standing on the east line (what became the down). As it crossed over the points that formed the north end of the passing loop the engine went onto the west line but the tender went onto the east along with the wagons behind it. The result was that the engine was pulled off the line and the train came to a stand. Four trucks were derailed, and three of them turned over killing five people and mortally wounding a sixth. The cause of the accident was given as a stone lodged in the points. The accident could have been prevented if the point lever had been held in position by a pointsman, but no instruction to do so had been given. At the coroner’s inquest the presence of the stone was blamed on a malicious act, and a reward was offered for the apprehension of an offender. The Board of Trade inspector, however, did not agree that it was a malicious act: he believed the stone had fallen into the points during works to the line. pitched-roof building was of a simple design, string-courses and quoins plus an oval decoration on the gable-ends, all in yellow brick, contrasted with the dominant red brick. To the north of the main station building there was an almost identical, but smaller, structure that housed waiting facilities. On the ‘up’ platform there was a simple timber waiting shelter. No signal box was provided at Brynkir, the loop being controlled by a lever frame located in the open on the down platform between the station buildings. At the north end of the station there was a water tank on the down side of the line that supplied watering facilities at the north end of both platforms. Access to the up platform was via a barrow crossing at the south end of the station. Brynkir had goods sidings. A timber goods shed and a cattle dock were located on the east side of the line south of the station. 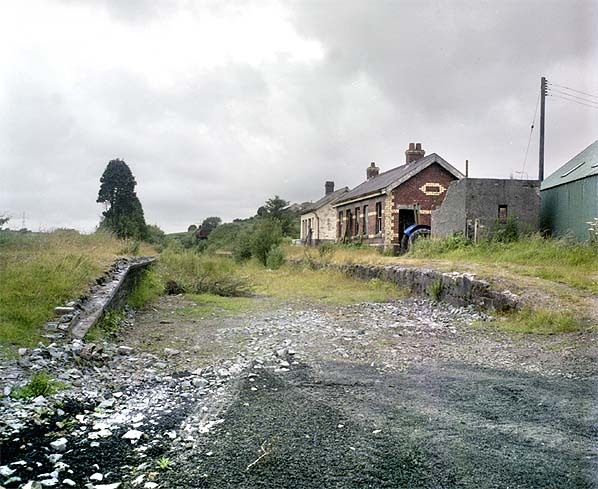 At first passenger services ran between Carnarfon Pant and Afon Wen with some trains continuing beyond Afon Wen onto the Cambrian Railway was not opened throughout until 10 October 1867. There were five up and five down trains Monday-to-Saturday and one in each direction on Sundays. From January 1871, with the completion of the Carnarvon Town line, trains were able to run between Bangor and Afon Wen. From 4 July 1870 the CR had become part of the London & North Western Railway (LNWR). In 1893 the passing loop was extended to take longer trains. 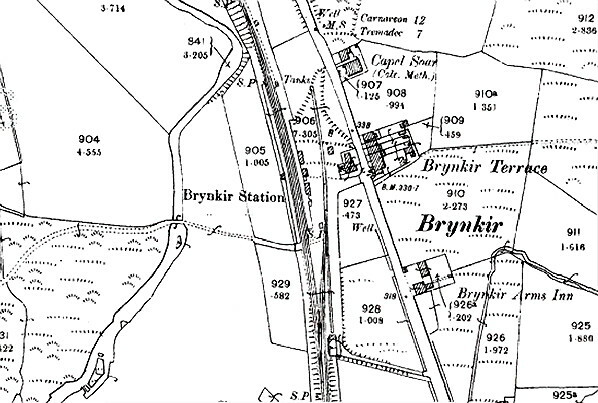 By December 1895 Brynkir had five up and five down trains on weekdays with an extra train in each direction on Mondays. There was also one train in each direction on Sundays. By July 1922 there were eight up and six down trains Monday-to-Saturday as seen in the table below. There were no Sunday trains. 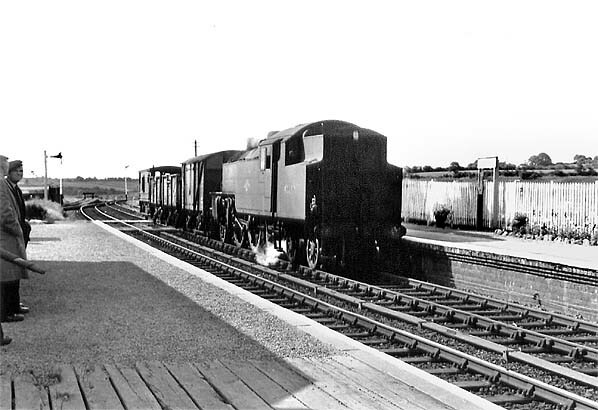 On 17 September 1920 another accident occurred at Brynkir when at 9.40am an Afon Wen to Bangor passenger train had a head-on collision with a down goods train from Caernarfon. The lever frame that controlled the signals and points at Brynkir was operated by a porter signalman, and on the day of the accident David Thomas had the responsibility. The goods train was actually accepted into the station by the stationmaster, Mr Hughes, a practice that was usual at the station. David Thomas had been busy loading a cart. The goods train arrived at Brynkir just after 9.25am. practice of more than one person operating the lever frame at one time was not a good one and that the railway company should ensure that only one person was in control of them during a shift. The goods train driver, David Harris, was commended for his action in trying to move the goods train away from the oncoming passenger. What the accident report highlighted was how busy Brynkir could be in the first half of the twentieth century. The station staff would not only be engaged with the arrival and departure of trains but also with the handling of merchandise and its onward delivery from the station. On 1 January 1923 Brynkir became part of the London Midland & Scottish Railway (LMS). By 1928 they were running ten up and nine down trains. The service was the same in the summer of 1932. 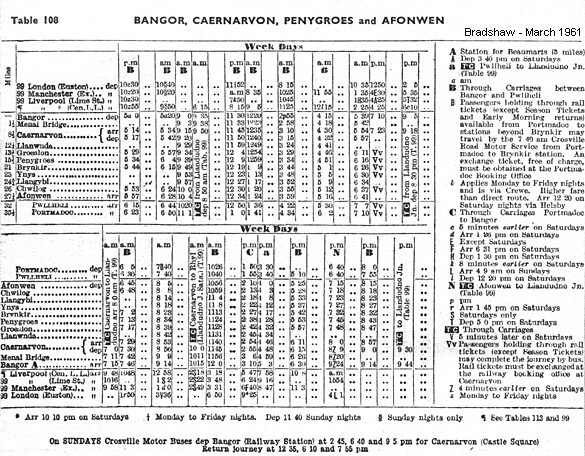 With the outbreak of the Second World War an emergency timetable was introduced from 11 September 1939, and Penygroes had only three trains in each direction on Monday-to-Saturday. The service was improved from 1 January 1940 when six trains ran in each direction on Monday-to-Saturday. On 1 January 1948 Brynkir became part of the British Railways London Midland Region. The summer 1948 timetable showed eight up and eight down trains Monday-to-Friday as shown in the table below. There was an extra up working on Saturdays. 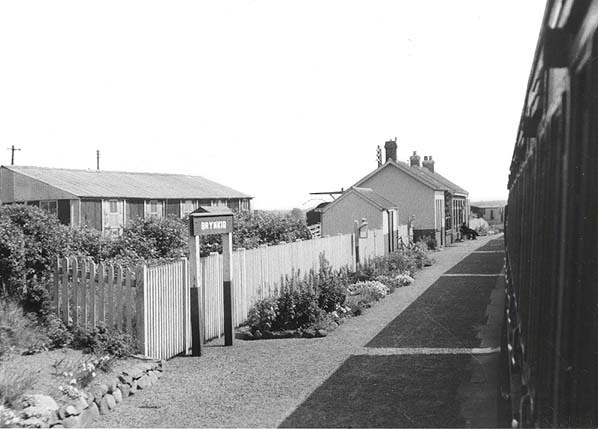 In 1939 Billy Butlin built a holiday camp at Penychain on the former Cambrian line to the west of Afon Wen. Due to the war it did not open for holidaymakers until the summer season of 1947 although it was used during the war by the Royal Navy. The opening of the holiday camp brought a lot of extra traffic in the form of holiday specials to the Menai Bridge – Afon Wen line during the summer months and the specials were much longer than routine service trains. To facilitate these trains the passing loop at Brynkir was extended yet again. At many of the stations, including Brynkir, platforms were lengthened. Even the scheduled services had improved by the mid -1950s. The summer timetable for 1955 showed ten up and ten down trains Monday-to-Friday as seen in the table below. On Saturdays there were twelve up and eleven down trains that called at Brynkir and other workings to and from Penychain that did not stop. There were regular cattle trains to Brynkir until 1957 there being a stock market in the village, south of the station on the east side of the line. DMUs were introduced onto many services from 1958. The line remained busy in the summer months into the 1960s but during the winter period it was very quiet. The Reshaping of British Railways report of 1963 (The ‘Beeching’ Report) recommended that the line between Caernarfon and Afon Wen be closed completely. This was despite the still very heavy holiday traffic in the summer. Interestingly in 1964 steam-hauled trains were used on most services with DMUs being sent elsewhere. The line closed completely on 7 December 1964. 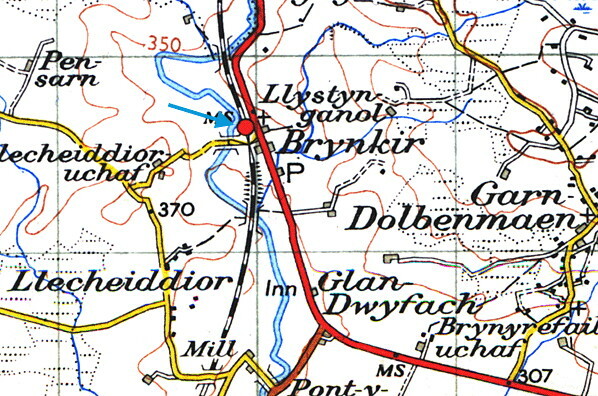 The line through Brynkir was not lifted immediately and track was still in situ in 1966. 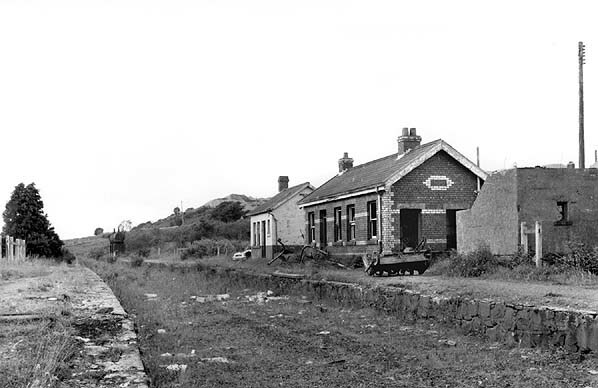 The station buildings survived in a derelict condition until the early 1980s. In 2012 the platforms could still be seen, the water tank and columns remained in situ and the trackbed had become a car park. The down direction platform at Brynkir seen from a passing train in June 1956. 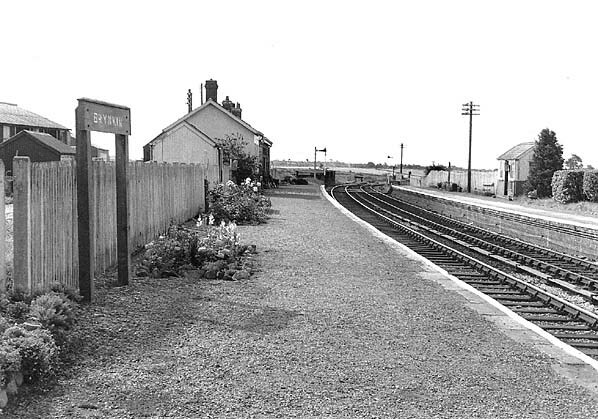 A view looking south at Brynkir in the early 1960s from the north end of the down platform. The main facilities were on the down platform and they can be seen in the middle distance. The up platform had only a simple timber waiting room. In 1962 locomotive No. 42209 is seen at Brynkir taking on water whilst working a class J freight train. 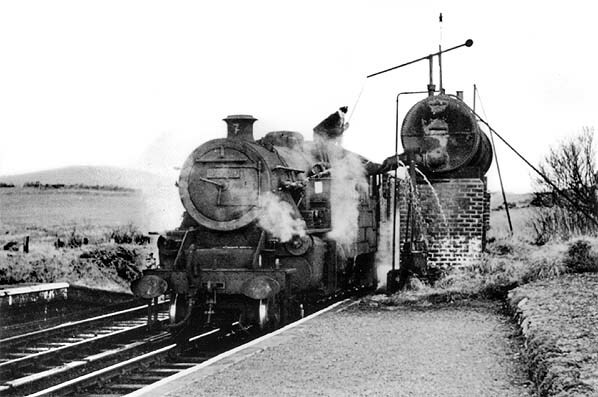 This 1945-built Fairburn Tank entered service on the 4 December in LMS ownership with the number 2209. It received the ‘4’ prefix on nationalisation and lasted in service until 6 February 1965 when it was withdrawn from 6H, Bangor shed, to be scrapped that October by Motherwell Machinery and Scrap. These class 4 2-6-4 tanks were a development of the Stanier passenger tank and the basis of R.A. Riddles’ Standard 4 tanks. The class totalled 277 and was introduced in 1945, the last 12 being withdrawn in 1967 with two going on to be preserved: 42073 and 42085. A local freight heads north through Brynkir in the early 1960s. In the summer of 1966, two years after closure, the track was still in situ at Brynkir. Except for the removal of signs the station itself also remained unaltered. The lever frame at Brynkir is clearly shown in this early 1970s view of the station. A porter-signalman was responsible for operating the levers. On 17 September 1920 the porter-signalman on duty made an error with this lever frame causing a crash that resulted in one fatality. 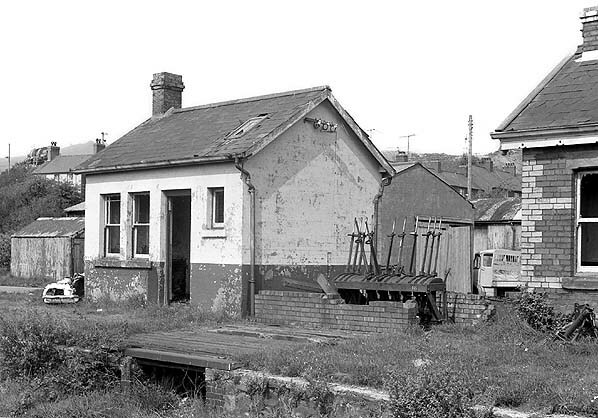 Looking north at Brynkir station in 1972. 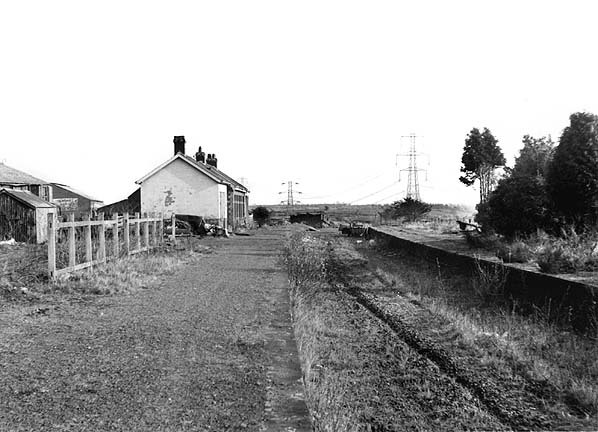 A view looking south from the north end of Brynkir station in 1973. Brynkir station was still standing when this view looking north was taken in May 1979. It would survive into the 1980s. Brynkir station looking north on 25 May 2012. The platform to the right (the former down) had a stone face and that to the left (the up) was constructed from brick. 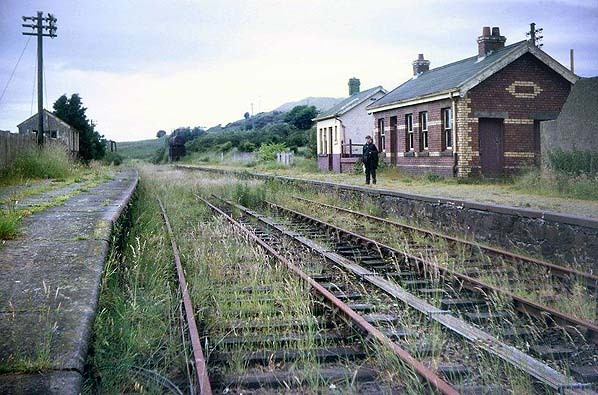 The down platform was the older of the two dating back to the opening of the station in 1867. Interesting survivors at Brynkir are the water tank and water towers which have been made into a feature. In this view taken on 25 May 2012 the north end of the station, where the watering facilities were located, is shown.